I wanted to thank you for the oscar bingo cards and ballot that you posted . I used them with a gathering of friends on oscar night and everyone had a great time. We even had prizes..the famous gold oscar chocolate bunny! Guys, thanks! It's great to hear. That origami looks like barnacles growing on the wall! Ditto Leslie about the Bingo cards and ballots! We had a few family night with them and can't wait to repeat next year! Also I thought about you when I saw this! I meant to say "fun" family night! I always read your posts, and I love them! I love the origami wall art, and the friendship bracelets are something that I still want to make someday. 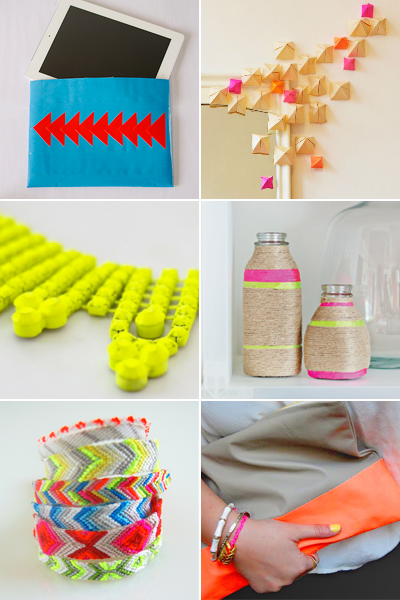 Love the balance of neon and neutral. That origami wall is amazing! The ipad case is really nice!! Oh my word! I used to make friendship bracelets all the time when I was 10 and it's so fun to see it coming back in vogue. What can we say -- the 90s are back!